Are you blindly following conversion optimization myths? Sticking to the so-called best practices won’t always produce positive results. 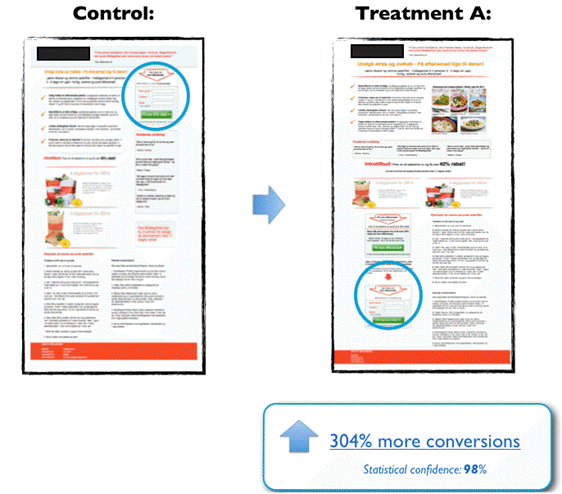 If you’re not testing enough, they can even hurt your conversions. In this article, let’s debunk some common conversion rate optimization myths. It is true that reducing the number of form fields can encourage your visitors to submit your forms. The lesser the number of fields, the easier it is to fill out for them. But while reducing the number of form fields might boost the quantity of leads, it won’t help their quality. And there’s no point in getting more conversions if they’re not the kind of conversions you need to grow your business. For example, IronMountain.com found that reducing the number of form fields significantly lowered the lead quality. For them, generating high-quality leads requires gathering more than just name and email. Instead of eliminating, they validated their form fields, which attracted high quality leads with more accurate form entries. Similarly, HubSpot also found that using a long request a demo form attract high-quality leads and weed out unqualified ones. Bottom line: Reducing the number of form fields can boost conversions but it can also significantly reduce the quality of your leads. If you’re looking to generate high-quality leads, you might want to validate your existing fields. If you’re looking to increase the visibility of your form, you might want to place it above the fold. For example, QuickSprout ensures that their optin form is visible to everyone by placing it above the fold. It could be a good strategy for them to boost signups. But should you always keep your forms above the fold? Michael Aagaard experimented with keeping forms below the fold, and found an incredible 304% more conversions. He made several other changes in the treatment, so the whole lift in conversions can’t be ascribed entirely to moving the form below the fold. However, this positive result wouldn’t have possible if he had blindly followed above the fold myth without testing. Bottom line: The idea that visitors won’t scroll is a myth. In a landing page, before asking your potential lead to fill out your form, you may need to explain about your offer and convince them to subscribe to it by explaining the benefits of subscription. Don’t be afraid to test different locations to place your contact form. 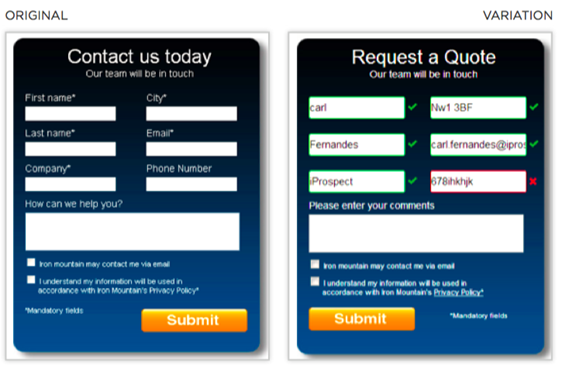 Adding a trust indicator beside your form is considered a conversion rate optimization best practice. 77% of your website visitors are concerned about their data being intercepted or misused online. 48% of your visitors look for trust indicators before giving personal information. 9 out of 10 users are likely to trust a website if it displays security indicators. The possible reasons for the drop in conversions could be that after reading the text, people got worried about privacy concerns. Without that text, the thought doesn’t even enter their heads. Bottom line: Conversions vary based on the niche and audience. You can test what resonates best with your audience and stick to it. Social proof is a persuasive tactic to trigger emotion because people often look at others before making a decision. 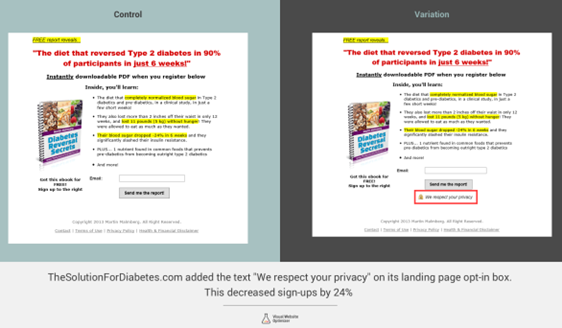 Showing social proof near to your form is considered a conversion rate optimization best practice because people assume, “if other people did it, I might as well too”. 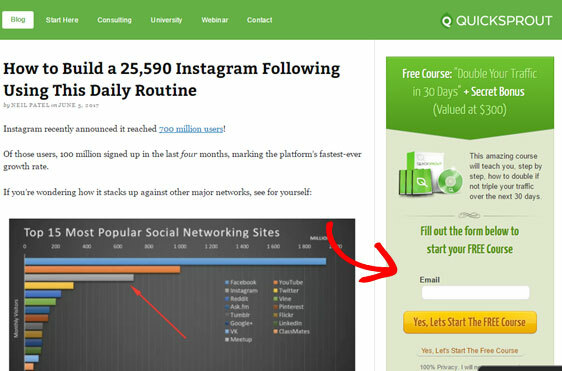 Showing the number of subscribers is probably the easiest way to add social proof. 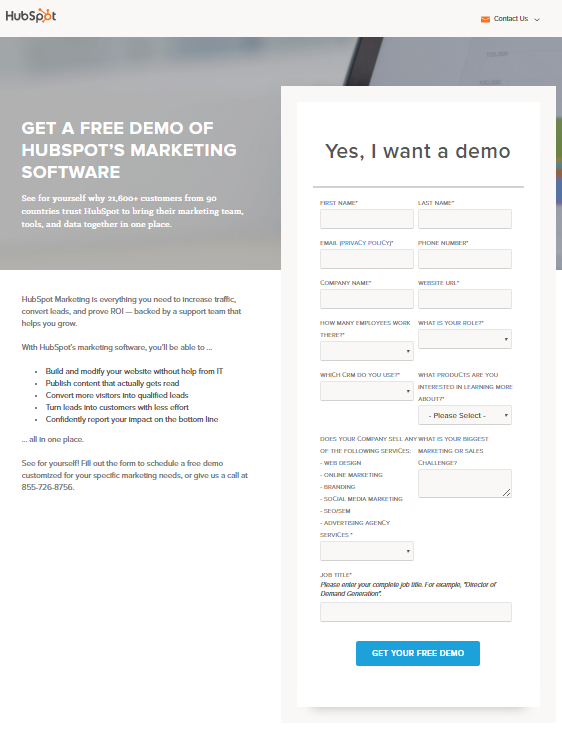 Let’s take a look at an A/B test example by DIY Themes. 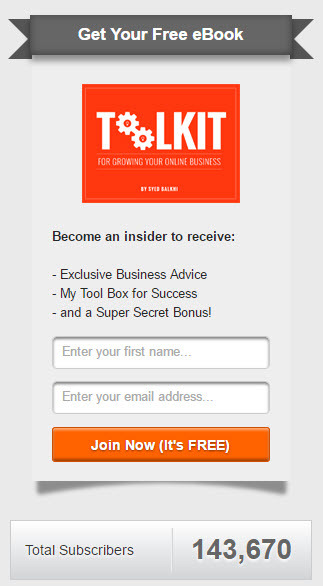 DIY Themes ran a split test on their sidebar signup form to see how adding social proof influences the conversion rate. They tested 3 different variations and surprisingly, found that removing social proof increased the conversion rate of their sidebar opt-in form by 102.2%. The reasons could be that additional texts just above the form may have distracted users. Or the number of subscribers displayed on the form may not be compelling enough for their visitors. Bottom line: If your subscriber stats are not compelling enough, you might want to combine the social counts of followers on different channels. You can also change the placement of the numbers. Instead of showing them above the form field, you can try displaying it below the submit button. For example, Syed Balkhi displays the subscriber count below the submit button. We hope this article helped you debunk some common conversion rate optimization myths. If you’re looking to boost conversions of your WordPress forms, you might want to read the following articles.